Something I've always felt lacking in is self-confidence. The ability to own who I am and not let my self-esteem be dented by other people is an area that I've put a lot of work into over the last few years. So many people seem to possess this innate ability to shine and to radiate self-confidence without any trouble at all. I look at them and think - they're not particularly beautiful, or super smart, or extremely talented, or possessed of personality plus, and yet they are secure in themselves and nothing phases them. I think a big part of it comes down to the stories we tell ourselves. If we believe we don't have value then that's the impression we give to the rest of the world. If we tell ourselves that we aren't as good as others or don't have what it takes to meet others on an equal footing, then we are always held back. I'm learning to shift my self-talk. I may not believe it every time I tell myself that I have just as much to offer as everyone else, but the more I say it, the more I start to live it. I give myself a kick in the pants when self-doubt sneaks in and remind myself that I truly deserve to live the life I've earned. I also recognize the impact other people have on my self-talk. I seem to pick up criticism and carry it around with me, so my modus operandi these days is to stay away from the nay sayers. Learning to ignore snide comments and remove hurtful people from my life has been a huge step towards belatedly gaining a genuine sense of self worth. When your friends recognize your strengths and encourage them then you can't help but become a better person. I'll never go back to trying to please everyone ever again. I won't work in a job where I'm not valued, I won't let younger people mock me (all those smug millenials can keep their snarky comments to themselves), and I won't have fake friends who are just going along for the ride. Have you discovered you have a wealth of talent and value that you've failed to fully acknowledge? Have you been like me and worried too much about what other people thought and not enough about celebrating who you are? Midlife is the perfect time to finally claim our place in the world and to truly accept ourselves - how great is that?! My inner voice is way too loud at times Shirley - but I'm getting better at ignoring it when it's trying to start a pity party! I think most of us feel a need for more confidence. I once led a class on it with many ideas including creating and achieving baby goals so you can build a pattern of success and changing your physical state with good posture and a big smile. Thanks for sharing your thoughts. We think alike. You're right about taking little steps Linda - and about how we physically present ourselves too. Being proactive and not giving into negative self talk makes a huge difference. I needed this so much! Avoiding negative people is my biggest hurdle. Several of them are in my family. Sigh. And when someone says something negative . . . well, I always think of that line from Pretty Woman: "The bad stuff is easier to believe." I know a few people who are happy to shoot others down in flames too Diane - it's so easy to get caught up with their negativity, but I'm also learning that a little distance makes things a lot easier to bear. I've struggled with confidence my whole life. It is especially painful when I see someone else get some opportunity or reward or job and I know that I am as good or better than they are. I have also struggled with taking credit for my own work- and amazed at the times I have let others take credit. I know I need to stop hiding my light under a bushel basket and am really working on it! 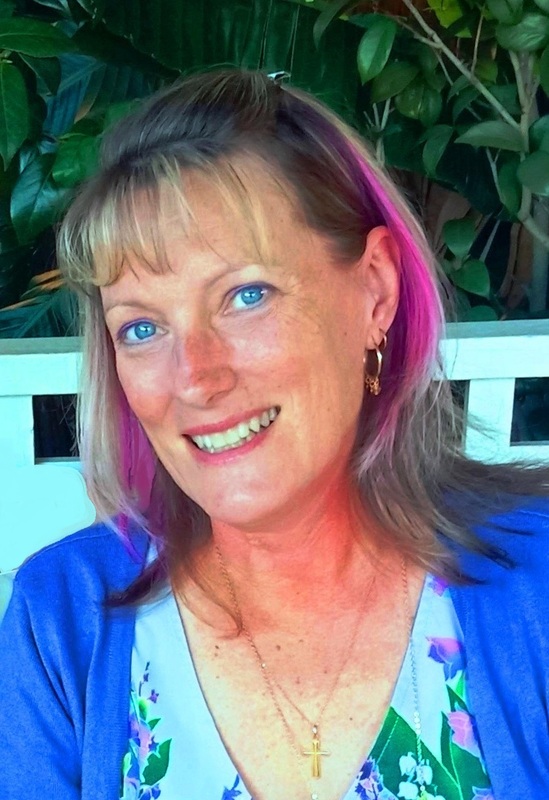 Leanne, I found blogging helped me gain a lot of self-confidence. As we all know, some posts are better received than others and getting that "tough hide" when things aren't going well has helped me keep going. That's been a huge boost. I learned you can "bomb" but still survive and do great the next post! I've been the same Laurie - blogging has opened my eyes to how great this age and stage are and how we still have so much going for us. 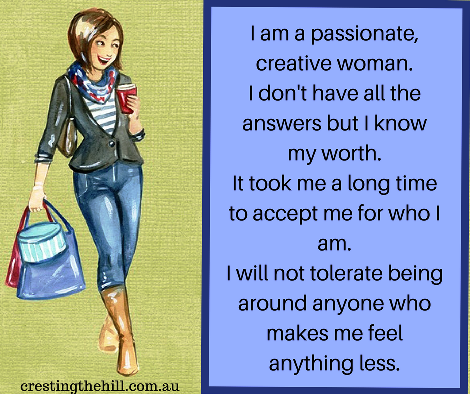 Connecting with positive and confident Midlife women has been the beginning of a whole new outlook on life for me. I can totally relate to this. All it takes is one snide comment from someone, and I feel like such a loser. Same goes whenever I receive a rejection from an editor at a website I'm submitting to. Ugh! I am hopeless at handling rejection and mockery Marcia - it just cuts me to the core and turns me into a self-doubter in no time. I guess that's why I don't submit my blog to too many places - rejection is a killer! 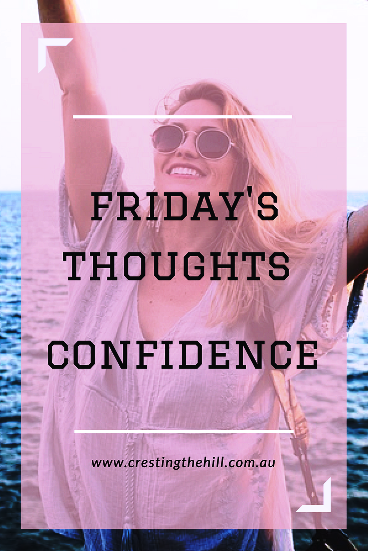 Some days I feel supremely self-confident, but then I make a decision or do something that someone questions and I feel lower than low; I questions everything I say and do for the rest of the day. I like to think I'm that same courageous woman who started the day, but for some reason I'm stuck in the self-doubt instead of the self-confirmation place. I like the affirmation you have here. I've found affirmations help heal my spirit and get me out of the negative thinking zone. And no, I don't believe it every time, but I am believing it more and more! I'm much the same Melody - I finally think I have it all together and I'm not bothered by the opinions of others, but a word or two of criticism and all my insecurities float back to the surface! Like you I am getting better at believing in myself but it's definitely a journey isn't it? I agree that it is important to surround ourselves with positive people...and to watch what we say to ourselves (even in jest). Thanks for another open and candid post, Leanne. That's the number one reason that I follow this blog! I think teaching that age group would be a good leveller Roseann - you'd be crushed if you didn't have a decent amount of self esteem! I think I haven't reached my full potential yet . Creating my own blog has been very cathartic for me to get my creativity and thoughts put out there. I can be my own worst enemy and need to watch the negative thoughts. Blogging has been a huge factor in discovering my long lost self esteem too Carrie. I love the way it's opened up my world and the fantastic people it's connected me to.